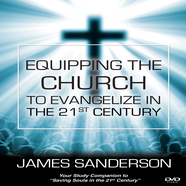 If you are interested in teaching from the workbook, you might consider purchasing the 24-lesson DVD series “Equipping The Church To Evangelize In The 21st Century.” This DVD series has me sitting across a kitchen table or in a living-room setting teaching someone 28 of the 39 lessons in the workbook. This is a great tool to help teach an adult class, teen class, jail ministry or in-home Bible study class. The cost of each video set is $20.00 plus shipping. If you would like to view the videos, please click on the player below. Click in the upper left corner for the playlist. If you are interested in purchasing this video series, please contact me on the order page.